You catch Pokémon like you do in Pokémon Go – Motion controls are required for catching Pokémon, either in the form of the gyroscope in handheld mode, the Joy-Con when docked, or via the Poké Ball Plus. You see Pokémon physically appear in the wild, tap on them to interact, and then enter a throwing screen much the same as the one in Go, with mechanics appearing largely the same too. No random encounters – Though you’ll still be searching through long grass for Pokémon, they won’t instantly spring upon you, instead appearing physically on the map screen. From there, you can either interact and catch, or leave them be. Pikachu and Eevee are set starters – You don’t get to choose from three Pokémon this time: in Let’s Go Pikachu and Eevee, those two Pokémon are your respective starters, although they can at least be put into your box if you end up not being a fan, although there are some big changes to how boxes work (more on that below). Pikachu rides outside of its ball on your shoulder, and Eevee on your head. Other Pokémon can follow you outside their balls, and you can ride some too – You can’t ride every Pokémon, but big ones (we’re not sure how big they’ll be but Onix and Lapras are some examples) can be ridden, whilst others can all follow you, like the hilarious Electrode in the reveal trailer. HMs are still gone – Riding Pokémon seems to be the main way you get past obstacles like water, as it was in Sun and Moon, although it’s not clear how similar the systems will be, but you won’t need HMs to ride Pokémon either. Trainer battles are still the same – Battles themselves are still turn-based, with Pokémon having four moves, and so on. You can import Gen 1 creatures from Pokémon Go to Let’s Go – Any Pokémon of the first 151 that you’ve caught in Pokémon Go can be transferred to Pokémon Let’s Go, via Bluetooth. How frequently and on what scale you’ll be able to do this is still up in the air, but Shinies will carry over, too! There’s local co-op – A friend can jump in at any point by using a second controller to help you, be that in a battle where they act as a ‘support’ trainer, or when catching a Pokémon. You can battle locally against people too. You can have multiple saves, but only one per Switch account – So, with one copy of the game both you and a sibling, say, could both play it on that console with your own saves. There are version exclusive Pokémon – This is now the main reason to think about getting both versions of the game, or making sure you and a friend have both versions covered. There’s no breeding in the game – Big implications for competitive players here, although it’s unclear if there will be any similar system available or not. It seems unlikely. You can’t get to Johto – Being set in Kanto (which famously was accessible from Johto in the Gold, Silver and Crystal games), some players were wondering if this was possible. Masuda said “I can confirm that you won’t be going to Johto”. So it seems that it’s not. Impact on canon – Another question is its position in the timeline and effect on the ‘canon’ of the mainline games is still unknown. 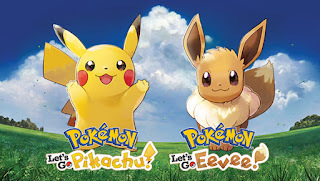 Eurogamer was present at the announcement conference and, when asked about this, developer Game Freak’s Junichi Masuda was… evasive, to say the least, refusing to talk about whether characters or references from the other core RPGs would appear in the Let’s Go pair at all.